The video was shared to bring awareness to the dangers of unsecured furniture. 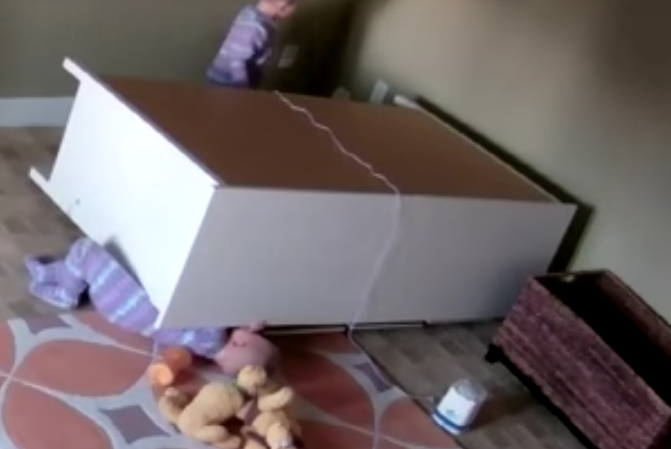 The parents of a set of twin toddlers took to Facebook to share a "miraculous" video taken on their nanny cam showing one boy trapped and struggling under a fallen dresser while the other attempts to, and finally succeeds at, freeing him. In the video, shared by the boys’ father Ricky Shoff, viewers can see the twins climbing on the dresser using its open drawers as footstools when it comes toppling down on top of them. The trapped child is seen crying and wriggling in an attempt to free himself from the piece of furniture pressing down on him, while his twin brother tries pulling on and pushing the dresser, seemingly strategizing while also in shock, until he eventually finds a means to free his brother. Shoff posted on Facebook that he was reluctant to share the video, likely fearing backlash, however, he did so to spread awareness on the apparent dangers of toppling furniture, namely dressers, which have been known to cause death and serious injury to children when not secured. Last month, Ikea, the leading Swedish home furnishings retailer, reportedly reached "a tentative settlement" in a case involving three families in the United States whose children died after Ikea chests and dressers tipped over. Ikea has since recalled some 8 million dressers and chests and 21 million other similar models in the United States.